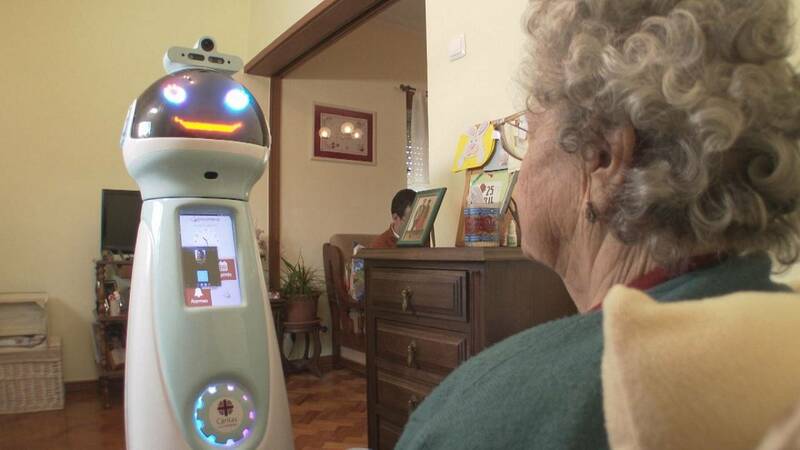 Seventy-nine year old Isabel Neto shares her home with Hugo, a robot that’s been designed to improve the quality of life for elderly people living alone. How, and to what extent, is that possible? We’re in Portugal to find out. The service robot is designed to be autonomous and navigate around domestic environments. It can also detect, recognise and track humans and objects. Ten years ago, Isabel suffered a stroke. She thinks the robot can eventually be useful for her. Developed by scientists from a European Union research project, the robot should eventually also be able to hear, see, express emotions and, most importantly, speak. The robots are connected to the Cloud to process information. Researchers say the technical challenges are huge because expectations for the robots are high. Further experiments in retirement homes are underway. Researchers are working on ways to use robots as links between the elderly and family, friends and caregivers. Now researchers are looking ahead at ways to bring their technology closer to the market. “If the economic (health) agents are convinced that this technology can actually help to address the challenges [in Europe], then that will create a market that will automatically feed the development of these technologies,” said Jorge Dias, Project Coordinator GrowMeUp Project. Researchers conclude that whatever the cost, the goal of supporting and encourage older people to stay active and independent for longer, is worth pursuing.